Years ago, my crafty and talented Aunt Marie created a family cookbook. 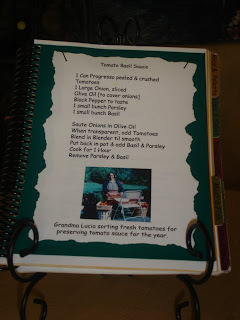 She compiled family recipes (old and new) along with photographs of family and Italy. 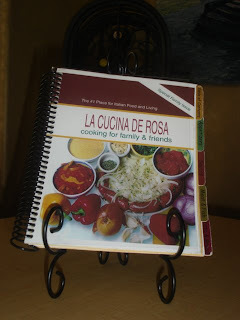 She then had it bound under the name "Cucina Di Rosa" after my Grandma Rose. Now the cookbook rests on the countertop of everyone in the family. It is a wonderful way of preserving old recipes, and leaving room for new ones with lots of blank recipe pages. I will henceforth try to post a recipe from there every so often. I am always looking for new ones, too. This recipe is SO simple, yet SO tasty. I chose this one first, as it is very basic and super easy to try...but look forward to more in the near future! Where can I buy this book. oh! I wish it was for sale! But it is more of a family thing:) My Aunt made it as a gift for everyone in the family at a Kinko's or something!! Are there cetain recipes you would like to see me post? I will definitely be posting more recipes from the book soon, and if you click on the recipe section of this blog, there are already quite a few posted! Good Luck! Oh thanks so much for the reply. I did not have a dish in my mind when I asked you that question. I am a working mom of two kids under 4. Any ideas for something that I can prepare over the weekend and heat it up in the weekdays for fast easy dinner would be a great help. 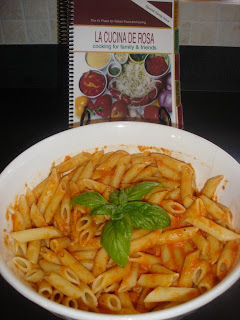 Or any suggestion for a good itallian cookbook. Thanks.